The artwork on the banner was created by Benny Shoults, an NNA member. Delaware’s Northwest Neighborhood has replaced banners and decorated new trees, drawing attention to the latest improvements in the area. In the last two years, the city of Delaware and the NNA have worked together to add almost 60 new trees throughout curb lawns in the Northwest Neighborhood. The NNA bought 16 trees through the city’s cost-share replacement program for street trees. The city of Delaware funded 42 trees. Bright, blue ribbons will adorn new trees throughout the neighborhood this summer. The Northwest Neighborhood is situated in the northwest quadrant of the city of Delaware, bound by West William Street, Olentangy River, Pennsylvania Avenue and Euclid Avenue. The Northwest Historic District was listed on the National Historic Register in 1996 and is one of two historic districts in Delaware. NNA is a nonproﬁt organization committed to preserving the quality of life and fostering a sense community and pride in the Northwest Neighborhood. The NNA holds annual fundraisers that include the biannual GhostWalk and the Historic Holiday Home Tour. Proceeds from these events help to serve and support charitable causes and fund neighborhood improvement initiatives. 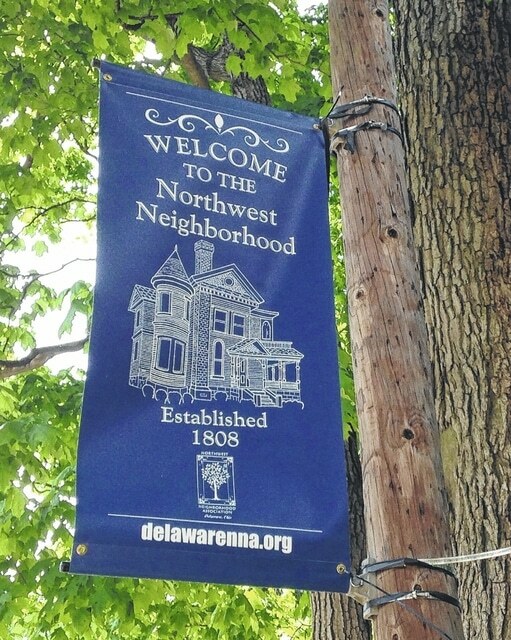 To learn more about the Northwest Neighborhood Association, visit www.delawarenna.org.